Sonny Melton and his wife, Heather, were listening to Jason Aldean sing country tunes at a Las Vegas music festival Sunday night when a noise rang out — the sounds of gunfire. Melton, a 29-year-old nurse in Nashville, sprang into action, shielding Heather from the barrage of bullets that rained down on the crowd of more than 22,000 people. Heather was one of the lucky survivors. Melton was not. “At this point, I’m in complete disbelief and despair. I don’t know what to say. Sonny was the most kind-hearted, loving man I have ever met. He saved my life and lost his,” she said in a statement to NBC affiliate WCYB. Melton is one of at least 58 people who were killed in the shooting, which is now the deadliest mass shooting in modern U.S. history. 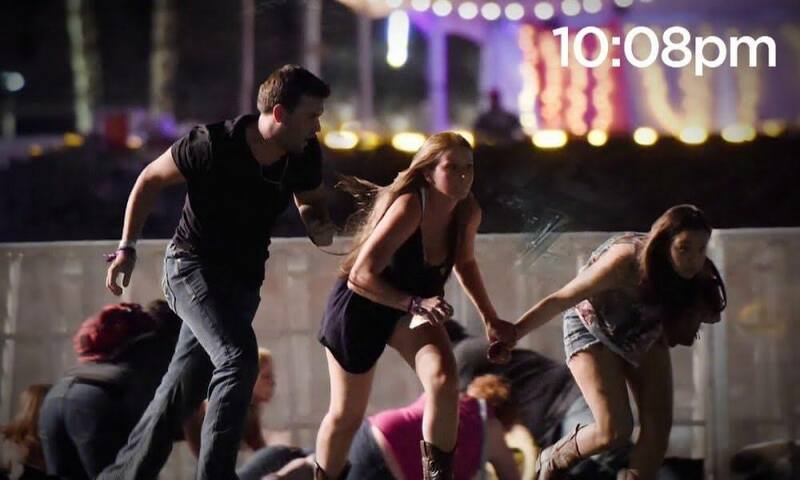 More than 500 concertgoers, hailing from different cities all over the country and world, were injured in the shooting at the Route 91 Harvest country music festival. One victim was a middle school special education teacher from southern California. Another victim was a beloved secretary in New Mexico. Information about the victims of the Las Vegas massacre slowly emerged Monday as families and friends learned the devastating news. Authorities are still investigating how the attack unfolded, but police identified 64-year-old Stephen Paddock as the lone gunman behind the rampage. Paddock opened fire on the Route 91 concert from his hotel room on the 32nd floor of the Mandalay Bay Resort and Casino, where he had been staying for days. When a SWAT team swarmed his room, they found Paddock dead from a self-inflicted gunshot wound. Authorities said they later seized at least 17 guns from the room. The Clark County Coroner’s office on Thursday released the official list of the 58 people who were killed in Sunday night’s mass shooting in Las Vegas. Here are their names. Hannah Ahlers, a mother of three from Murrieta, Calif., is remembered as part of a skydiving community who enjoyed both outdoor thrills and simple pleasures, reports the Los Angeles Times. “She never came across with the diva mentality she easily could have had. She was a devoted mother and wife,” friend Sunni Almond told the Times. Heather Alvarado, 35, of Utah, was the happiest when she was with her family, especially her three children, according to her husband, Albert. “She would do ANYTHING for them,” Albert said in a statement issued through his employer, the Cedar City Fire Department. “She always saw the good in others. She spent her whole life serving others in her family and community.” Albert said his wife also loved traveling with her family, even if they were just day trips. Dorene Anderson, of Alaska, was the “most amazing wife, mother and person this world ever had,” her family said in a statement. “Due to this horrific and terrible situation, our family is dealing with a great loss,” the statement said. “We are so grateful and lucky for the time that we did have with her.” Anderson was devoted to her family. She also loved hockey, according to Marie English, secretary of a local nonprofit hockey organization. “She was friendly to everybody. She had a heart of gold. She was just an all-around, wonderful Alaskan,” English told the Alaska Dispatch News. Anderson’s longtime friend D.J. Fauske told the newspaper that Anderson was a “saint of a person.” “I’ve watched her daughters grow up to become amazing women and I know they will continue their mom’s lasting legacy,” Fauske said. When bullets starting raining down from above, Jack Beaton leaned his body over his wife, Laurie, and wrapped his arms around her in full protection. “He told me, ‘Get down, get down, get down.’ He told me, ‘I love you, Laurie’ and his arms were around me and his body just went heavy on me,” Laurie told the Associated Press. The two had traveled from Bakersfield, Calif., to Las Vegas to celebrate their 23rd wedding anniversary at the Route 91 country music festival. The last thing Beaton ever did was save his wife’s life. “I screamed his name and he wasn’t answering me. There was a lot of blood,” Laurie said. Beaton, a 54-year-old construction worker, had been shot and later died. He leaves behind a 20-year-old son and an 18-year-old daughter. “I knew every day that he would protect me and take care of me and love me unconditionally, and what he did is no surprise to me, and he is my hero,” Laurie said. Candice Bowers was a single mother of three, who had recently grown her family by adopting a 2-year-old, relatives told the Orange County Register. Bowers, 40, was a hardworking restaurant waitress who always managed to take care of her entire family on her own, Bowers’ grandmother, Patricia Zacker, told the newspaper. “She never had any support, except herself,” Zacker said. Bowers’ family had encouraged her to have some fun and go with a friend to the musical festival in Las Vegas. But she never made it out of the venue alive. Zacker remembered her granddaughter for her smile and big heart. “She was a generous girl,” she said. Denise Burditus of Martinsburg, W.Va., was a grandmother who attended the festival with her husband, Tony. “It saddens me to say that I lost my wife of 32 years, a mother of two, soon to be grandmother of five this evening in the Las Vegas shooting,” Tony wrote on his Facebook page, according to MetroNews, a radio station in West Virginia. “Denise passed in my arms. I LOVE YOU BABE.” Tony posted a picture of the two of them kissing on his Facebook page on Monday. Andrea Castilla was celebrating her 28th birthday in Las Vegas with family when terror struck. She was holding hands with her sisters watching the show when gunshots and yells of “Duck!” broke out, reports the Associated Press, citing the family’s GoFundMe page. “Sadly, Andrea was shot in the head.” wrote her aunt Marina Parker. Castilla was carried by family members to a nearby highway, where a truck drove them to a hospital. She died after arriving at the hospital. The family said that due to a mix up with another patient, they were told of her death hours later. Denise Cohen was supposed to return to California High School in Ramon, Calif., where she graduated in 1977, for a reunion in mid-October. The school’s alumni association confirmed her death Tuesday on its Facebook page. “She was an amazing, vibrant, positive classmate and friend,” wrote her friend and fellow graduate Tina Lippis-Mancebo. Cohen died with her boyfriend, 56-year-old Derrick “Bo” Taylor, the AP reports. Her son, Jeff Rees, recalls her laughter, as well as how she made people around her feel their best. In Riverside, Calif., loved ones of 29-year-old Austin Davis were anxiously waiting for Davis to turn up somehow after he attended the musical festival in Las Vegas and went missing after the shooting. They eventually learned he never made it out alive. “I can’t believe this happened. You didn’t deserve this,” his girlfriend, Aubree Hennigan, wrote on Facebook. Christiana Duarte had recently graduated from the University of Arizona with a business marketing degree, according to the Los Angeles Times. The 21-year-old was working for the Los Angeles Kings hockey team when she was gunned down during the Route 91 music festival, family members told NBC Los Angeles. She was among those declared missing after the massacre. Stacee Rodrigues Etcheber was enjoying the Las Vegas music festival with her husband of 13 years, Vinnie Etcheber, a San Francisco police officer. When bullets rang out, Vinnie instructed his wife to run for safety while he sprang into action, helping victims, according to the San Francisco Chronicle. The two got separated, and Stacee was later shot and killed, family members said, according to the Chronicle. Stacee Rodrigues Etcheber, 50, was a longtime hair stylist back home in California. Her brother-in-law, Al Etcheber, wrote on Facebook that Stacee leaves behind two children. Almost 24 hours earlier, Al Etcheber had posted a plea for people to help find Stacee, who was missing at the time. Brian Fraser was his stepson’s “rock” and “mentor” before a gunman ended his life. Nick Arellano, 25, told the Orange County Register how his father loved seeking thrills and adventures. Fraser, 39, enjoyed hunting, deep-sea fishing and snowboarding. He recently started learning how to fly airplanes, Arellano said. Fraser, of La Palma, Calif., leaves behind his wife and four children. “He helped anyone who asked. That’s why people loved and adored him,” Arellano said. Angie Gomez was a 2015 graduate from Riverside Polytechnic High School in Riverside, Calif., the school’s PTSA confirmed in a Facebook post. “She will always be loved and endeared by our Poly Family,” the post said. Hartfield was also a published author, who wrote a memoir detailing his time working in law enforcement in Las Vegas, titled Memoirs of a Public Servant. It was published in July. Chris Hazencomb died shielding his best friend’s wife from a hail of bullets at the music festival in Las Vegas, according to his mother, Maryanne Hazencomb. She took her son off life support Monday morning after he was shot in the head, she told the Ventura County Star. “You don’t expect your kid to go before you go,” Maryanne Hazencomb said. Chris Hazencomb worked at the Walmart Neighborhood Market in Camarillo, Calif. He and his mother were very close. In the duffel bag he took to Las Vegas, there was a Route 91 T-shirt with a pink flamingo, according to the Star. It was a gift for his mother that he was never able to give her. Jennifer Irvine, a San Diego attorney, died in the shooting spree, her law firm, Fair Cadora, confirmed in an email to TIME on Tuesday. According to Irvine’s profile in a directory of legal professionals, her interests included snowboarding and hot yoga. She had earned a black belt in the Korean martial art Taekwon-do. Teresa “Nicol” Kimura was killed when the gunman opened fire for the second time. The thirty-eight-year-old from Placentia, Calif., was in Las Vegas with six friends, who all survived the shooting rampage, reports the Orange County Register. “Her spirit was beautiful, her laugh was infectious, and she just had a way of making every time we gathered an awesome one,” said her friend Ryan Miller, a pastor who attended the music festival with Kimura. Carly Kreibaum, 33, of northwestern Iowa, was killed in Sunday’s mass shooting in Las Vegas, her sister-in-law Sarah Rohwer told the Des Moines Register. Kreibaum had attended the music festival with two friends, who escaped unharmed after seeing Kreibaum get shot, according to the Sioux City Journal. Grieving family members told the Boston Globe that Rhonda LeRocque from Tewksbury, Mass., was killed while attending Sunday’s open-air concert with her husband and young daughter. LeRoque worked for a design firm in Cambridge, Mass., and was active in her church, the Globe reports. Family members said her husband and daughter were unharmed. Loved ones remembered Victor Link as a music lover who held his family together. “He was the best of us,” Link’s sister, Lisa Hiestand, told the Washington Post. “He always had the time, no matter what, for family and friends.” Link — of Shafter, Calif. — loved music festivals and often traveled around the state with his fiancée to attend them, according to the Post. Jordan McIldoon was a mechanic apprentice from Maple Ridge, British Columbia in Canada. British Columbia Premier John Horgan said all government buildings in Victoria and Maple Ridge would fly their flags half mast in McIldoon’s honor. McIldoon’s last moments were spent with Heather Gooze, a Las Vegas bartender who was helping injured concertgoers. When a group of men came carrying McIldoon, Gooze stayed with him, she told CBC Radio. She “felt his fingers, like, tighten and then loosen,” she said, discovering that he had died. She then stayed with him, answering calls from his loved ones on his cell phone, and messaging his family members on Facebook.